We’ve all read about the new facelifted 2013 GLK350 in the usual motoring press publications and online… I’ve read several synopsis of the new car, and they’re all the same, nobody ever really lays out the differences side by side, with both cars sitting next to each other, until Dave Knows Cars. This article will be laid out in a similar manner to my “Differences between the C300 Sport and C300 Luxury” article (one of the most visited and commented on posts on the Dave Knows Cars Blog). The goal here is to educate the reader about both vehicles… the 2013 model and those GLKs built during the 2010 – 2012 model years. This should help you decide which car might be right depending upon whether you’re looking at new cars, Certified Pre Owned examples or both… this should help you weigh the options. The 2013 GLK350 get mechanical as well as cosmetic changes. Let’s start on the outside…. Our subject 2013 Mercedes GLK350 in Palladium Silver, this is a fairly standard car, with the new style standard wheel and NO appearance package. 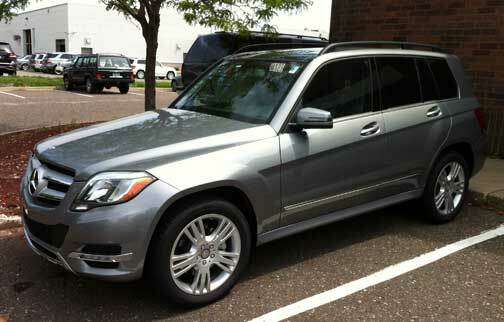 This is the standard GLK350 ‘look’ for MY 2013. This is the standard equipment 2012 Mercedes Benz GLK350, NO appearance package, this car has the standard GLK wheels for 2012. The most notable cosmetic differences start in the front of the vehicle. The 2013 model gets a new grille with chrome topped horizontal bars, the front bumper and lower front fascia are all new. ALL the metal panels on the two vehicles are the same, only the plastic wrap around bumper and lower front fascia have changed. The new 2013 model gets a sporty chrome front skid plate at the very bottom of the front fascia, as well as standard LED daytime running lamps (similar to the C and E classes). The other major front end difference is the new headlamp shape / style for the 2013 models. 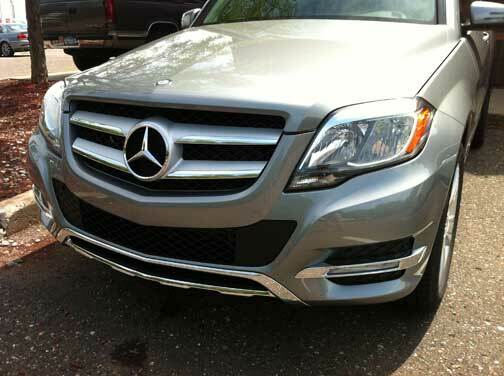 Have a close look at our 2013 GLK350 here: New grille, front bumper and lower front fascia, notice the new LED daytime running lamps which replace the standard round fog lamps on the 2012 model GLK350. Fancy new headlamp treatment too. 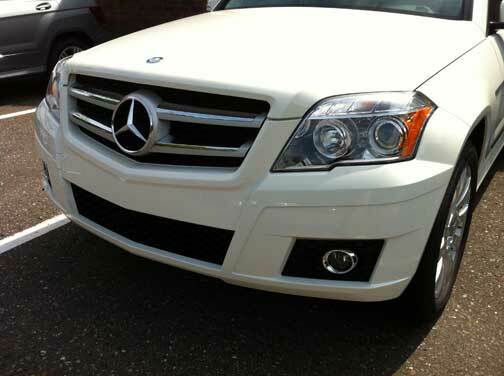 This is the 2012 model GLK350… different grille, lower front bumper and fascia are all white plastic… no chrome, round fog lamps instead of the LED daytime running lamps, different headlamp shape. 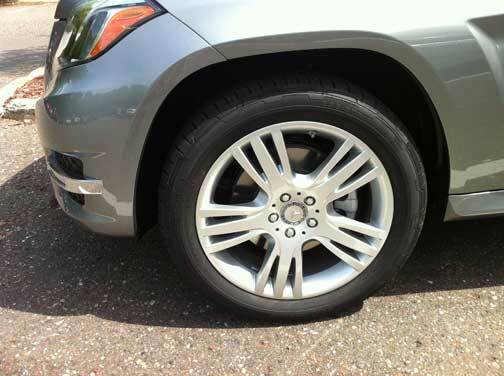 This is the new, standard equipment, 19″ wheel for the 2013 model GLK350. A larger 20″ wheel is available if you opt for the “Appearance Package”. 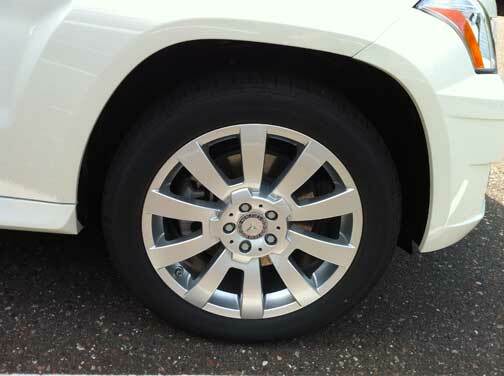 This is the standard 19″ wheel for GLK vehicles built between the 2010 model year and 2012. The rear ends of the vehicles have changed in a similar way… the 2013 gets some visual updates, but also some new technology. 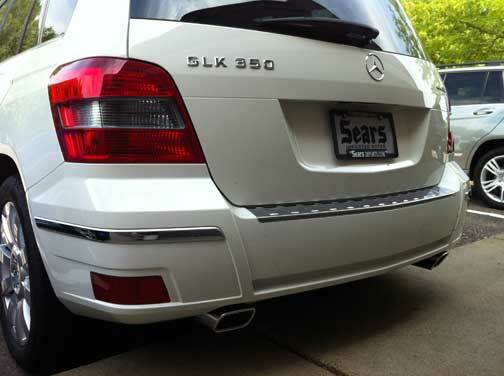 The rear plastic bumpers are all new on the 2013 model GLK class cars. 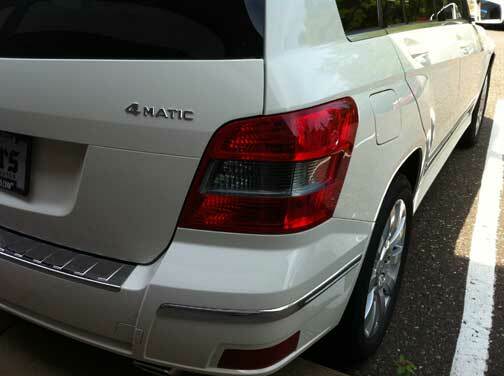 You’ll notice that the 2013 GLK has chrome down low on the rear bumper, the red lights integrated into the rear bumpers are in a difference place and a different shape, the 2013 model also gets a new tail pipe treatment. 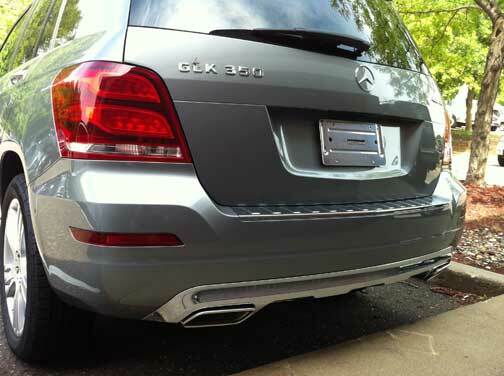 The rear end of the new 2013 GLK350 reveals a new plastic bumper, the lower part of the bumper incorporates a chrome ‘skid plate’ and new tail pipe treatment. New rear tail lamp design boasts LEDs. The rear end of the 2012 GLK appears a bit more simple and less stylized. The tail pipes don’t seem as integrated here, different tail lamp treatment. In addition to the visual enhancements and a new tail lamp shape, the 2013 GLK350 gets LED rear tail lamps while the 2012 models still use regular incandescent bulbs. The rear license plate is also lit by LED lamps on the new 2013 models. 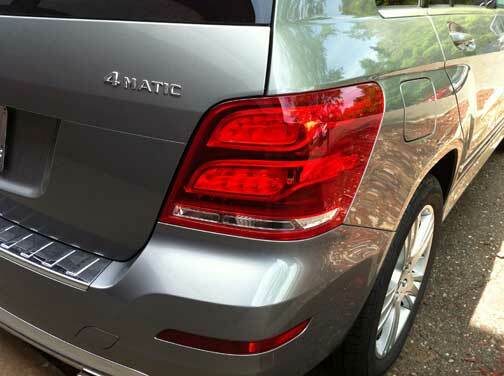 The 2013 model GLK gets a new tail lamp, LED tail lamps in fact. They light up more quickly when the brake pedal is applied and LEDs last longer than traditional bulbs, while using less energy. The original 2010 – 2012 GLK350 tail lamp, uses regular incandescent bulbs. 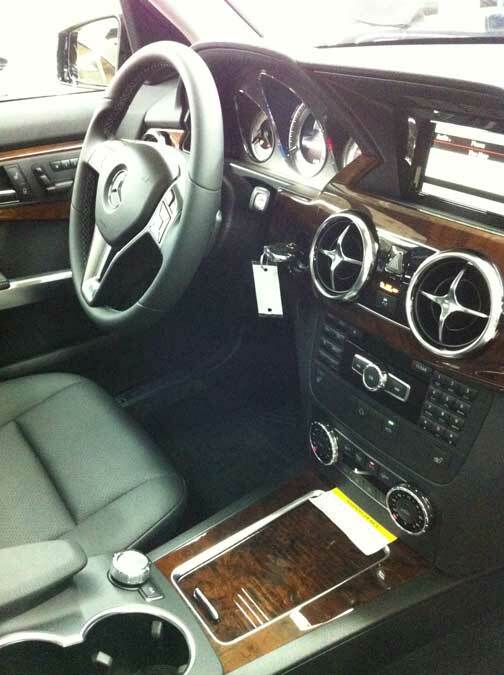 Moving to the interior of the vehicle… the 2013 GLK gets many of the changes that we saw appear in the 2012 model C classes in terms of dash layout. The 2013 models get the new steering wheel we saw appear int eh 2012 model C class cars… but also, all the vents have been upgraded and their shape has been changed to emulate the SL and SLS round shaped air vents. Like the rest of the new Mercedes-Benz model line, the display within the instrument cluster is now full color, not just white pixels on a black back ground. 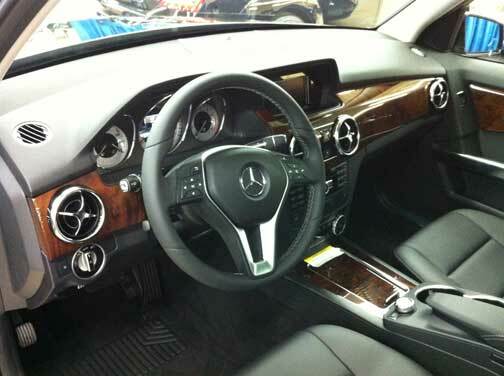 Big changes on the inside of the new 2013 GLK… notice the vents, steering wheel and full color instrument display. If you look closely, you will see there is NO gear shift selector on the console… read on for more info about that! Since 2010 the gear shift selector for the GLK has been in the console between the seats, so the cup holders were just in front of the arm rest. 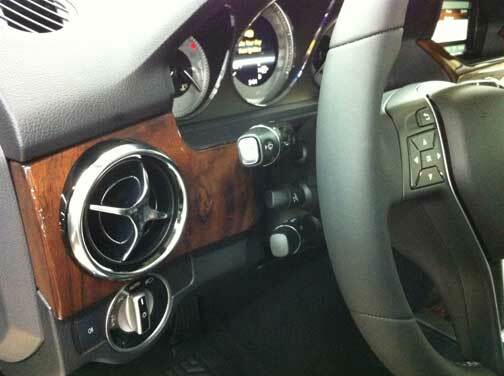 Well, the new 2013 GLK models have the same electronic transmission selector, on the steering column, to control the 7 speed transmission as the GL, M, S and E class vehicles from Mercedes-Benz. This makes room for more cup holders and storage under that little roll back wood piece where the gear shift selector used to be. This is the 2012 GLK dash and interior. Doesn’t seem quite as intricate or rich looking, still a great vehicle though, just a different look. 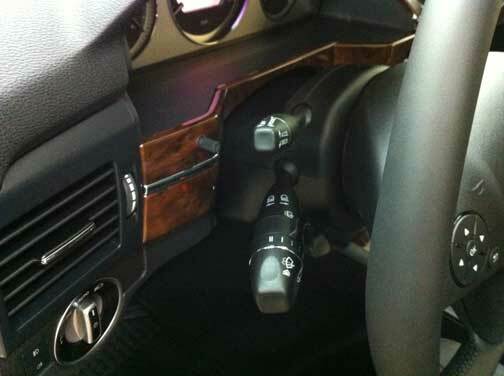 Transmission selector of the 2012 model, like the 2010 and 2011 models, are situated in the console, good cup holders are right behind the gear shifter. Mechanical upgrades for the interior, beyond the transmission selector relocation includes the addition of the same Electro-Mechanical steering system that is found in the 2012 model ML350, it no longer uses a hydraulic power steering system. This makes the vehicle very easy to turn and maneuver at low speeds, say, in a parking lot, but the steering stiffens as speeds increase. The other big change on the inside for long time Mercedes-Benz owners is the change in position of the cruise control and turn signal stalks. For 20+ years the cruise control stalk has been the upper most stalk on the left side of the steering wheel while the lower stalk has always been the turn signals / wiper controls. Thanks to all the potential customers Mercedes Benz surveyed during the redesign of the 2012 model ML350 (mostly women, mostly Lexus owners) the positioning of these two controls were changed. Apparently, if you’re a driver of Japanese cars, you’re used to hitting the upper most stalk for teh turn signals and people were constantly turning on the cruise control when trying to signal a turn. Interestingly, this happens on almost EVERY SINGLE test drive I’ve ever been on with anyone who hasn’t owned a Mercedes-Benz before. I tell people as we’re getting int he car, they still hit the cruise control as they’re attempting to signal the first turn out of the lot.. no joke.. it happens almost every time. Changed after 25+ years, the turn signal stalk is the upper most stalk on the left of the 2013 GLK350, the cruise control is below. The little stalk in between the two is the power steering column adjustment. This is a shot of the 2012 turn signal / cruise control placement. This has been the standard placement of cruise and turn signal stalks since at least the early 1980s as far as I can tell. Notice the steering column mounted transmission selector… this new placement gives you new space for additional cup holders and more storage in the roll back console area. So, we’ve covered all the enhancements you can SEE on the GLK.. but what lies under the hood. The new GLK350 get the newest Mercedes-Benz direct injection V6 engine that appeared inthe new ML350 in 2012 and now resides in the 2013 model E class cars. The new V6 ups its horsepower from 268HP in 2012 to 302HP for the 2013 model year… ft./lb of torque also increases…. and while we’re increasing numbers… let’s touch on the improved fuel efficiency. The new 2013 mode GLK gets a couple of more miles per gallon according to the EPA (who always have conservative estimates, far less economy that actual owners experience). 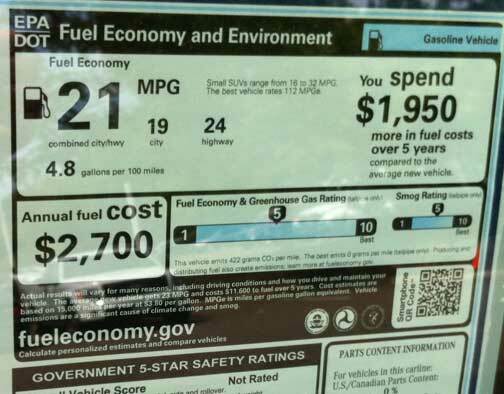 A shot of the window sticker of the 2013 GLK350… according to the EPA the car gets 19mpg in the city and 24mpg on the highway, about 3 miles per gallon more than the outgoing 2012 model. 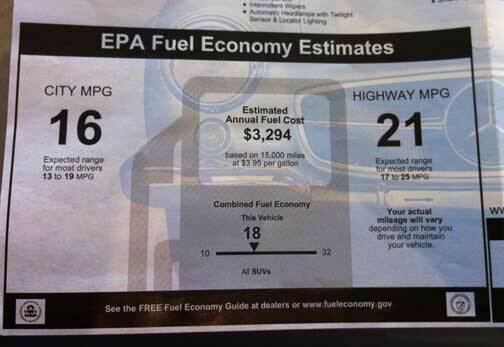 This is the window sticker of the 2012 model… 16mpg city, 21 mpg highway, combined fuel economy of 18MPG. Real owners always get better than these estimates. My wife recently completed a 22 hour round trip drive in her 2012 GLK from Minneapolis to Toledo, OH… she averaged a little more than 26mpg on the highway with the cruise control set at 74mph. 5 miles per hour better than the EPA states on the window sticker, so it might not be too much of a stretch to think the new GLK is capable of about 30mpg on the highway. If I have a chance to take an extended road test in a new 2013 GLK, I will report back here and let you know what I find. So the first face lift of the GLK is out and about, available at dealers today. The new direct injection engine is certainly noteworthy, the new steering system is too, but in my eyes, not a huge deal. There will be a number of option packages for the new 2013 GLK… an Appearance Package to include 20″ wheels and stainless steel roof rails among other things. The next big thing in the GLK world will be the GLK350 BlueTEC diesel arriving in the U.S. in early 2013. There will be a lot of talk about it… it should be good for mid 30s MPG… but chances are we will sell few of them sue to the general distaste the American buyer has for diesel (unfounded of course, it’s really a pity). Those who want them are nuts about them.. those who don’t are just as nuts in their distaste for them. My next article will focus on my thoughts about the used GLK market.. it’s been very strong since the GLKs were released…and chances are it will remain strong. 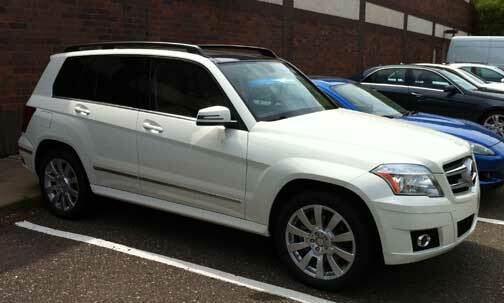 I have the 2010 Mercedes GLK350, and so far, I am loving it! I love the look. I love the feel. And I love the smooth ride! The rectangular box like of the SUV is appealing to me. I should mention I keep my cars for 8-10 years. Have had (and love) my 2004 E320 wagon for almost 9 years, 191000k mi. Looking to switch to a GLK vs invest more into my beloved wagon. Hi Kristine, No GLK is a ‘good investment’ in 8-10 years it will be worth 1/3 what you pay today, but you will get plenty of use and enjoyment out of it. In this case, I’d go with the lower mile car.. it’s a no brainer. There were significant changes to the GLK for the 2013 model year, especially the interior… transmission selector moved to the steering column, new electronics (infotainment), dash, vents, display / instruments, etc. etc. but the 2012 is a great car and I’d opt for lower miles, any day, no brainer.